The OxyDerm Professional Beauty Device has been developed by the professionals at TEI SPA to aid in the purification and sterilization of skin, fight against inflammation, and accelerate the skin’s metabolism. TEI SPA professional technology has made it possible for those with blemish prone skin to experience maximum anti-acne results in the comfort of their own home, in just minutes a day. The OxyDerm not only helps clear up acne and blemished skin, but visibly brightens skin tone and complexion for health, radiant skin. By strengthening cell functions to expel carbon dioxide and environmental toxins it accelerate metabolism, improves the absorption of oxygen and increase immunity. Negative ions can improve quality by revitalizing natural youthful looking skin. By using a flat silent electrical release system to produce ozone, the oxyderm starts to sterilize the germs which reduces or removes acne. When the violet light combines with the effect of the ozone and high frequency wave it immediately starts producing healthy skin. When used properly the oxyderm will sterilize, reduce inflammation, dissolve dirt, balance the PH of the oil on the skin and eliminate acne revealing clean healthy skin. High frequency treatments are used to stimulate, sanitize and heal the skin. Used for years, this type of treatment is designed to provide high frequency currents that generate warmth in the skin and stimulate nerve endings, in turn increasing blood circulation, nourishing the skin and improving product penetration within the skin. By increasing skin metabolism, high frequency ozone facials encourage healthy cell function and promote skin healing. Direct high frequency offers the results of treating dry and dehydrated skin by increasing the activity in the sebaceous and soporiferous glands and causing a skin warming effect. Direct high frequency ozone provides benefits for those with blemish prone and acneic type skin by killing bacteria and eliminating oils. In addition, high frequency facial treatments result in an improvement of the appearance of the skin as well as a reduction in fine lines and wrinkles. High frequency acne machines are a safer alternative to invasive approaches such as laser resurfacing, dermabrasion, and chemical peels. They works better than antibiotics because the bacteria cannot develop immunity against ozone. 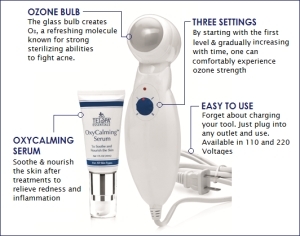 The OxyDerm At Home Ozone Facial Device works by generating tiny pulses of electricity, much like static electricity. When this static electricity travels through the air it ionizes the air it’s passing though creating ozone (or three molecules of Oxygen) which possesses strong oxidation or sanitizing abilities. By expelling carbon dioxide into skin, your skin is able to absorb more oxygen, which allows better circulation. By strengthening cell functions you improve the clarity and quality of your skin, giving it a more beautiful, clear and youthful appearance. When the OxyDerm device is lightly touched to the skin, a mild therapeutic electrical current passes through the treatment head bulb creating a host of purifying oxygen molecules. The bulb produces a very subtle violet glow and a pleasant, therapeutic zapping or tingling sensation which may be adjusted via the power control dial according to your comfort level. Removal all metal Jewelry before use. Not for use by individuals with braces. Be sure to use the OxyDerm only on clean and dry skin. It is recommended to use the OxyDerm nightly after removing all makeup, cleansing and drying the face. •For Oily Skin: Produce a drying effect that kills bacteria and diminishes excess sebum. Use daily, or as needed, on T-zone and U-zone in small circular motions for 1-2 minutes. •For Combination Skin: Use 3-4 times per week, or as needed. Focus use on oily areas and use minimally on sensitive areas. •For Dry Skin: Produce a warming effect that increases activity in the glands and optimizes skin nourishment. Use 2-3 times per week, or as needed, on T-zone in small circular motions for up to 1 minute. •Treat the Back & Body by using tool in large circular motions for 1-2 minutes. Ideal for treating acne, marks and redness on the body. •Treat the Chest & Neck by using tool in large circular motions for 1-2 minutes. Ideal for treating redness, irritation and sensitivity on the body. •Treat Specific Blemishes by using the tool in a small circular motion at a slower pace on affected area or blemish. Use for up to 30 seconds per target area. - not use AHA or Glycolic Acid products or wear metal jewelry during the session. - avoid broken capillaries, spider veins and areas of rosacea. - not for pregnant women or patients with heart disease and pacemakers installed. Traditional methods of acne prevention don’t get you the results you'd really like. Fortunately, the lead inventor of TEI Spa discovered a breakthrough in how we sterilize our skin and rid of and prevent acne. Using High Frequency Technology, OxyDerm glides through the face while producing Ozone to kill bacteria that causes acne, redness and inflammation. Gently remove dirt, oil and shine while getting the radiant skin without harsh chemicals and drying cleansers.